Stranded migrants in Greece blocked the railway and demanded entry into Western Europe. European countries shut their borders to economic migrants the past week following the ISIS Paris attacks. 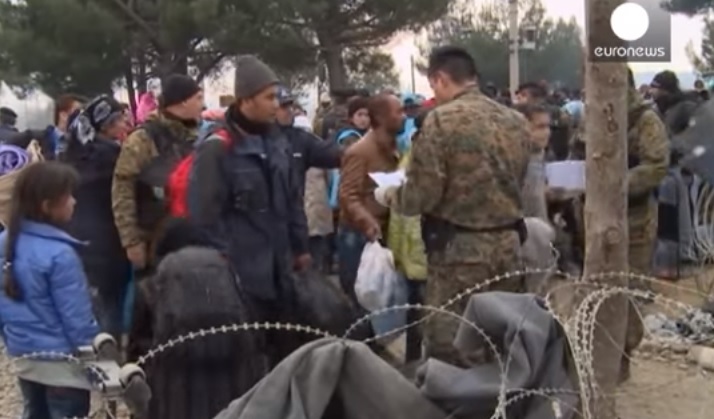 Migrants continued to flood into Eastern Europe over the weekend. Another 1,500 migrants arrived in Piraeus over the weekend. At least 85 of the migrants had suspicious papers and were detained. Moroccans, Iranians and Pakistanis on Greece’s northern border with Macedonia have blocked rail traffic and demanded passage to western Europe, stranded by a policy of filtering migrants in the Balkans that has raised human rights concerns. Hundreds of thousands of people, many of them Syrians fleeing war, have made the trek across the Balkan peninsula after arriving by boat and dinghy in Greece from Turkey, and headed for the more affluent countries of northern and western Europe, mainly Germany and Sweden. Last week, however, Slovenia, a member of Europe’s Schengen zone of passport-free travel, declared it would only grant passage to those fleeing conflict in Syria, Iraq and Afghanistan, and that all others deemed “economic migrants” would be sent back. That prompted others on the route – Croatia, Serbia and Macedonia – to do the same, leaving growing numbers stranded in tents and around campfires on Balkan borders with winter approaching.